Architectural exhibition openings are hardly known for their cool vibe, but that’s apparently because they’re not usually put on by LA-based Barbara Bestor Architecture. 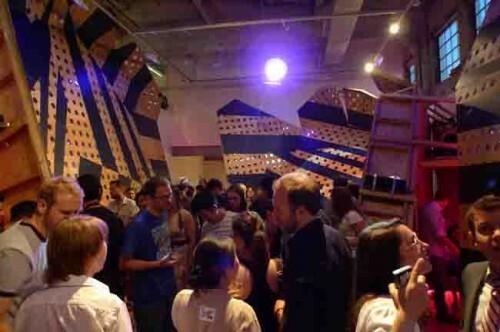 On April 1 SCI-Arc opened Bestor’s Disco Silencio to a crowd very eager to party. 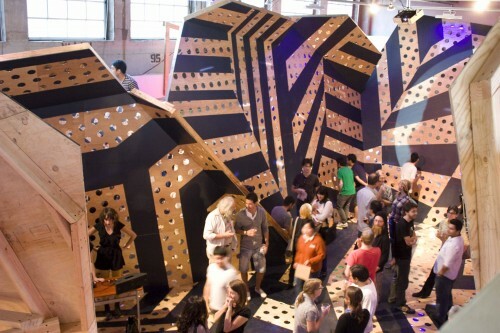 The installation at the SCI-Arc gallery is a demi-dodecahedron formed in plywood meant to be a silent retreat for frazzled SCI-Arc architecture students (at least when the DJ isn’t spinning and disco lights are whirling). At first, the installation is extroverted and very, very gregarious. Using a technique applied to mislead enemy bombers about the size, speed and direction of warships in World War I, a bold black graphic stripe across the plywood brings the eyes to and from everywhere. The strategy works as well on the dance floor as on the battlefield. Mirror ball fragments embedded throughout the self-described “polyhedron of hedonism” capture and refract the sunlight coming from the gallery’s clerestory windows, only adding to the space’s energy. Standing in the middle of the semi-opened dodecahedron, one feels a like a gift slowly being unwrapped, dare we say let loose (?) as the structure unfolds and opens skywards, laying right against the SCI-Arc gallery walls. But Bestor hasn’t forgotten her clients: bleary-eyed SCI-Arc students and looking for a place of respite. Despite its hoppin’ ambiance, she creates opportunities for introversion. Underneath, between and beside the demi-dodecahedron’s bold presence, the firm creates pink-tinged tunnels and a little bunk bed built into the negative space. It’s a welcome discovery for tired wanderers. 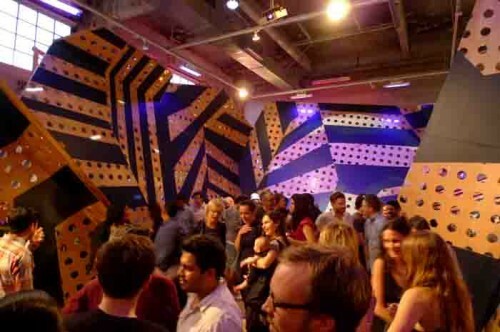 When empty of partygoers, the space also reverts to a more serene version of a disco dancefloor. Its any three intersecting planes make perfect cubbyholes to just get away from it all. 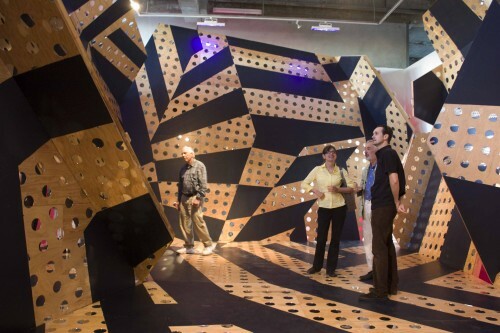 Disco Silencio will be on exhibit at SCI-Arc Gallery until May 15. On April 8, 7pm, catch an exhibition discussion with architect Barbara Bestor and SCI-Arc Director Eric Owen Moss.